This week we have a rather unimposing limestone cobble, at least from the outside. It was collected way back in 1989 by my student Genga Thavi (“Devi”) Nadaraju (’90) as part of a Keck Geology Consortium field project in southeastern Spain. It comes from the Los Banós Formation (Upper Miocene) exposed near the town of Abanilla. 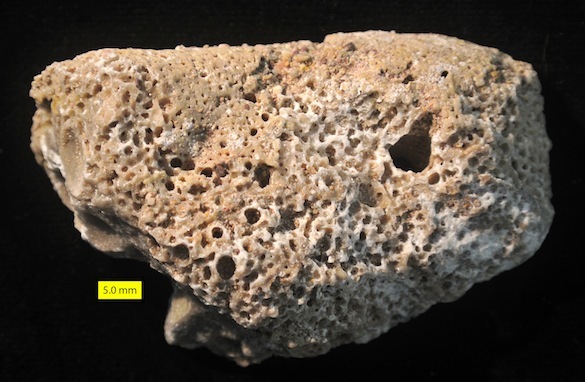 The holes are borings excavated into the carbonate matrix by marine animals. This cobble was tossed about in a coral reef complex that was part of the ancient Fortuna Basin. Seeing the cobble in cross-section makes it much more interesting. (Geologists love their rock saws!) We now see two categories of borings: one is large and flask-shaped, and the other a small network of spherical cavities. The large borings were produced by bivalves that tunneled into the limestone to make living chambers (domichnia) from which they could filter-feed. As the bivalve grew, the hole became deeper and wider. There was no escape — making and living in a boring like this is a lifetime occupation. These bivalve borings are classified as the trace fossil Gastrochaenolites lapidicus Kelly and Bromley, 1984. The smaller borings were made by clionaid demosponges that used acid to create a series of connected chambers, also for filter-feeding. These sponges could only penetrate about ten mm or so before their filtering became ineffective, so they are confined to the outer periphery of the cobble. 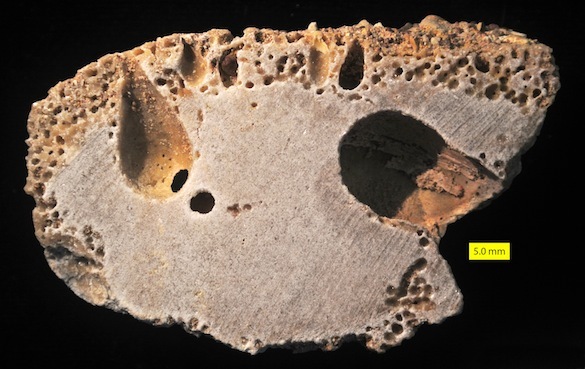 The sponge borings are given the trace fossil ichnogenus Entobia Bronn, 1837. On the inside surface of the largest boring (right side), encrusting tubes of a serpulid worm are just visible. This serpulid was also a filter-feeder. It took advantage of the cozy hole after the bivalve borer died and decayed. It is called a coelobite, or cavity-dweller. Serpulids would have had a rough time cementing to the outside of the cobble as it rolled around in this high-energy environment. Bronn, H.G. 1834-1838. Lethaea Geognostica (2 vols., Stuttgart).